Found 17 file extension associations related to LightWave 3D and 14 file formats developed specifically for use with LightWave 3D. LightWave (or, more properly, LightWave 3D) is a computer graphics program for 3D modeling, animating and rendering. LightWave has rendering abilities and unusual user interface (for example, icons are not used; instead functions are all given descriptive titles). LightWave was one of the first high profile industry standard 3D packages featuring a built-in radiosity render engine, complete with a complex light calculation model for support of caustics. Some functions within LightWave are multi-threaded, which means that those components can simultaneously use multiple processors in the same machine when performing complex calculations. Programmers can expand LightWave's capabilities using an included SDK and also a special scripting language called LScript. This SDK is based on the powerful C language and almost anything can be created, from a custom shader to a different scene format exporter. LightWave itself includes dozens of free plugins and many more can be obtained from different developers around the globe. 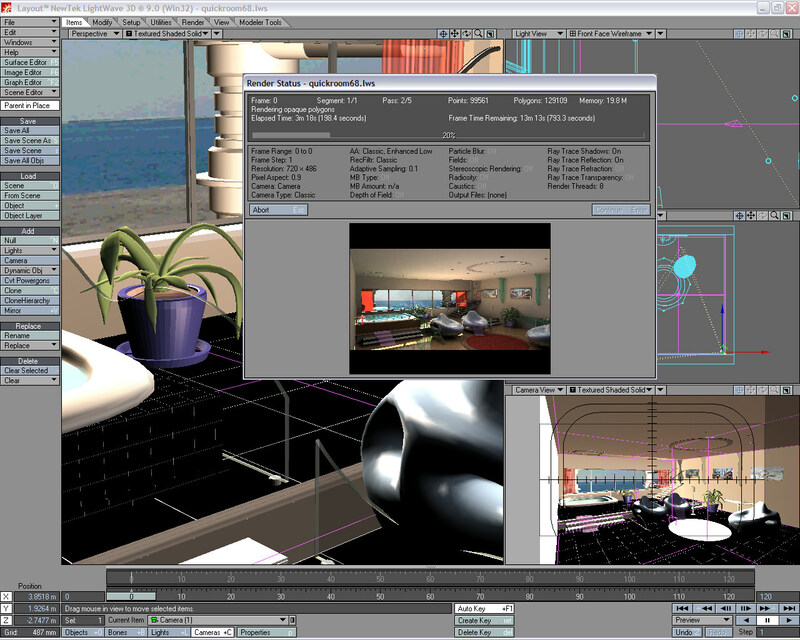 Unlike other 3D packages, LightWave is composed of two separate programs: Modeler and Layout. Each program is specifically designed to provide the most efficient workspace for specific tasks. Appropriately, Modeler provides tools for creating 3-dimensional objects, whereas Layout provides a workspace for lighting, animating, and rendering. When the two programs are running simultaneously, a feature called the Hub can be used to automatically synchronize data between the two applications via TCP/IP protocol. Layout contains the LightWave renderer which provides the user with several options including Ray Tracing options, multithreading, and output parameters. This differs from most 3D computer graphics packages such as the popular Maya and 3D Studio Max, whereas they contain the renderer and the modeler all in the main program. This attributes plenty of versatility to LightWave as the user has several specific options they can customise via either program. It creates less confusion as well, and can provide easier methods of organisation. If you need more information please contact the developers of LightWave 3D (NewTek, Inc.), or check out their product website.